Pumpkin Fine Cars and Exotics: Don't Miss Out On This Mustang! 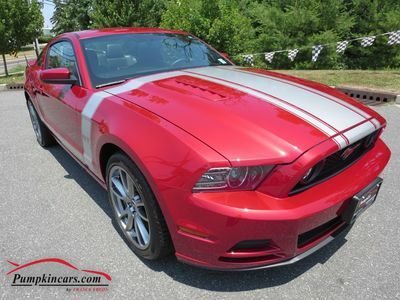 Don't Miss Out On This Mustang! ONLY 4,559 MILES! ** GT PREMIUM 6-SPEED WITH BREMBO BRAKE PKG ** FULL FACTORY WARRANTY UNTIL AUGUST 2016 ** ONE OWNER, CLEAN VEHICLE HISTORY REPORT ** Race Red Exterior with Black LEATHER Interior ** PARKING SENSORS, Dual HEATED Power Seats, Xenon Headlights, Rear Spoiler, Racing Stripes ** BREMBO BRAKE PACKAGE includes 19 Premium Alloy Wheels, Brembo 4-Piston High-Performance Front Calipers and Rotors, Rear Single-Piston Calipers and 11.8 Vented Votor; Unique AdvanceTrac Electronic Stability Control Tuning ** PREMIUM SHAKER Sound System with CD Player, MP3, Satellite Radio, Microsoft SYNC Bluetooth ** V8, 5.0 Liter Engine, RWD, Cruise Control, Tilt Wheel, Power Locks, Power Windows, and more! Stop by our UNIQUE INDOOR SHOWROOM TODAY or CONTACT US AT (609)646-7676. You can also send us an email at[email protected] or log onto www.pumpkincars.com for more information! 36 MPG HIGHWAY! Just arrived at Pumpkin! Pumpkin Car of the Day! Don't Miss Out On This Steal! Which Mercedes-Benz fits your personality? Price Changes on Pristine Pumpkin Cars! Need A Truck For A Big Haul? Prices Are Going Down At Pumpkin Fine Cars! Pumpkin Featured Car of the Day! Pumpkin Feature Car of the Day! Pumpkin's Car of the Day! Show us your Pumpkin spirit!